Continuous graphics. A re-usable solution for all types of shell scheme. 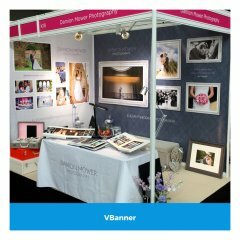 VBanner offers different fastening options but hook & loop fastenings let you adjust your VBanner to hang just right. Typically 1600mm deep for ease of handling, VBanner can also be supplied full height - 2400mm to fit below the ceiling grid and down to the floor. 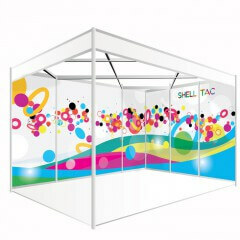 VBanner works with all types of shell scheme - wooden ones, aluminium ones and cloth-covered ones. 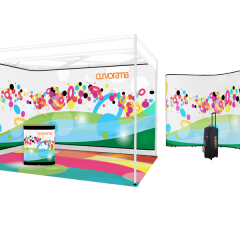 Giant, seamless pvc print supplied on a cardboard roll in a choice of widths. 1600mm covers the part of a shell scheme where most people look and fits easily into most cars. 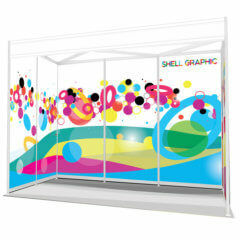 2400mm covers your booth from floor to ceiling.